A Viewport class is used to render a scene with the specified settings. Integrate the engine to a 3rd party renderer (or vice versa) and render the image anywhere (via the render() method): to the external library, App interface, TextureRender interface (a frame buffers abstraction), etc. Qml and ViewportQt samples are available only for the Engineering and Sim editions of UNIGINE SDKs. Render a scene to the image (data will be transfered from GPU memory to CPU memory) or texture (data stays in the GPU memory). To render the scene to the Texture interface, use the renderTexture2D(camera,texture) method. Render a node to the image (data will be transfered from GPU memory to CPU memory) or texture (data stays in the GPU memory). To render the node to the Texture interface, use the renderNodeTexture2D(camera,node,texture) method. You can set callbacks before and after any rendering pass using the addCallback() method: thus, getting access to the intermediate state of rendering buffers and matrices. Some of them are read-only, but most of them can be modified ad hoc. The callback can get a Renderer pointer. Thanks to this feature you can get direct access to G-Buffer, SSAO, lights or any other effect. One more example: you can create a custom post-process and apply it before TAA, thus, getting correct antialiased image as a result. You can even create your own custom light sources, decals, etc. The feature can also be useful for custom sensors view. Viewport class has different rendering modes: RENDER_DEPTH (depth only), RENDER_DEPTH_GBUFFER (depth + G-buffer), RENDER_DEPTH_GBUFFER_FINAL (depth + G-buffer + final image). This can give you extra performance boost if you need only depth info, for example. To set any viewport as a main, use the setViewport() method of the Render class. A single viewport should be used with a single camera, otherwise it may cause visual artefacts. To avoid artefacts, when using several cameras with a single viewport, all post effects must be disabled using the setSkipFlags() method with the SKIP_POSTEFFECTS flag. See the usage example below. Creates a new viewport with default settings. Sets the aspect correction for current viewport. Return the value indicating if the aspect correction enabled for current viewport. Adds a callback for the specified stage of the rendering sequence. Clears all added callbacks for the specified stage of the rendering sequence. Removes the specified callback from the list of callbacks for the specified stage of the rendering sequence. Sets a value indicating if the first frame should be enabled over the current frame. Returns a value indicating if the first frame is enabled over the current frame. Sets the rendering mode for the current viewport. Returns the rendering mode set for the current viewport. Sets a name for the environment texture. Sets the type of lighting for the render node. Returns the type of lighting of the render node. Returns a value indicating if a 180-degree panoramic rendering is enabled. Returns a value indicating if a 360-degree panoramic rendering is enabled. Sets the specified render mode. Returns the current render mode. Sets the skip flag for the current viewport. Returns the skip flag set for the current viewport. Returns a value indicating if the stereo rendering is enabled for the current viewport (one of the stereo modes is set). Sets the focal distance for stereo rendering (distance in the world space to the point where two views line up, i.e. to the zero parallax plane). Returns the focal distance for stereo rendering (distance in the world space to the point where two views line up, i.e. to the zero parallax plane). Updates the virtual camera offset (an offset after the perspective projection). Returns the virtual camera offset (an offset after the perspective projection). Updates the radius for stereo (the half of the separation distance between the cameras (i.e. between eyes)). Returns the current radius for stereo (the half of the separation distance between the cameras (i.e. between eyes)). Appends specified skip flags to the list of currently used ones. Returns a value indicating if the specified skip flags are set for the current viewport. Removes specified skip flags from the list of currently used ones. Renders an image from the specified camera. Renders an Engine viewport for the specified camera to the current rendering target. Renders an image from the camera to the given 2D image. Renders the image from the camera to the cube map of the specified size. Renders the given node with all children to the current rendering target. Renders the given node with all children to the 2D image of the specified size. Renders the given node with all children to the specified 2D texture. Renders given nodes with all their children to the current rendering target. Renders given nodes with all their children to the specified 2D image. Renders given nodes with all their children to the specified 2D texture. Renders a stereo image in the current viewport. Renders an image from the camera to the specified 2D texture. 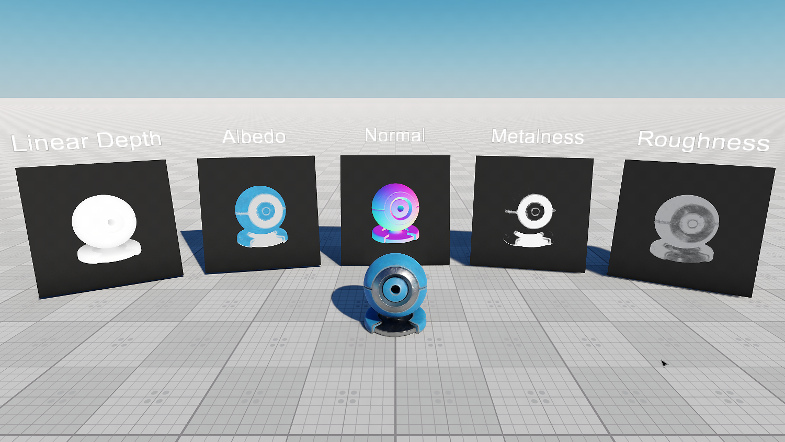 Sets custom meshes to be used for culling pixels, that are not visible in VR. Clears meshes that represent hidden areas for both, left and right eye. Enables the default stereo mode - no stereo and panoramic rendering in the current viewport is available. This mode is set by default for a new viewport. Enables rendering of the viewport as a 180-degree panorama with curved edges. Enables rendering of the viewport as a 180-degree spherical panorama (fisheye). Enables rendering of the viewport as a 180-degree linear panorama without distortion at the edges. Enables rendering of the viewport as a 360-degree panorama with curved edges. Enables rendering of the viewport as a 360-degree spherical panorama (fisheye). Enables rendering of the viewport as a 360-degree linear panorama without distortion at the edges. Enables the anaglyph stereo mode that is viewed with red-cyan anaglyph glasses. Enables the horizontal stereo mode that is supported on mobile devices. Enables the interlaced stereo mode that is used with interlaced stereo monitors and polarized 3D glasses. Enables the separate images stereo mode. This mode serves to output two separate images for each of the eye. It can be used with any VR/AR output devices that support separate images output, e.g. for 3D video glasses or helmets (HMD). Enables the replicate images stereo mode. Enables the vertical stereo mode that is supported on mobile devices. Skip rendering of dynamic reflections in the viewport. Skip rendering of RG11B10 formats in the viewport. Skip rendering of post effects in the viewport. Skip shadows rendering in the viewport. Skip rendering of the srgb color space. Disables data streaming in the process of rendering. Skip rendering of transparent objects in the viewport. Skip rendering to the velocity buffer for the viewport. Skip rendering of the visualizer in the viewport. This flag is set by default for a new viewport. Use lighting from the auxiliary virtual scene containing one LightWorld (with 45, 45 and 45 degrees slope angles), scattering is not used. Use lighting from the LightWorld set in the current loaded world. Render only depth and Gbuffer. Render depth, Gbuffer and final image. RENDER_REPROJECTION Render stereo reprojection for VR. Sets the aspect correction for current viewport. 1 enables correction, 0 disables. int correction - 1 to enable aspect correction, 0 to disable. 1 if the aspect correction enabled, otherwise 0.
int callback - Stage of the rendering sequence for which a callback is to be added. One of the Render::CALLBACK_* variables. The _BEGIN prefix corresponds to the beginning of the rendering pass, _END - to its completion. Unigine::CallbackBase1< Unigine::Renderer * > * func - Callback pointer. ID of the last added callback of the specified type, if the callback was added successfully; otherwise, nullptr. This ID can be used to remove this callback when necessary. Clears all added callbacks for the specified stage of the rendering sequence. Callback functions can be used to get access to buffers and matrices at intermediate stages of the rendering sequence. Some of them are read-only, but most of them can be modified ad hoc. int callback - Stage of the rendering sequence for which the callbacks are to be cleared. One of the Render::CALLBACK_* variables. Removes the specified callback from the list of callbacks for the specified stage of the rendering sequence. Callback functions can be used to get access to buffers and matrices at intermediate stages of the rendering sequence. Some of them are read-only, but most of them can be modified ad hoc. int callback - Stage of the rendering sequence for which the callback is to be removed. One of the Render::CALLBACK_* variables. void * id - Callback ID obtained when adding it. True if the callback with the given ID was removed successfully; otherwise false. int frame - 1 to set the first frame flag; otherwise, 0. 1 if the first frame flag is set; otherwise, 0. Sets the rendering mode for the current viewport. It can be one of the stereo or panoramic modes or the default mode. int mode - A rendering mode. Returns the rendering mode set for the current viewport. It can be one of the stereo or panoramic modes or the default mode. const char * name - A texture name. 1 if a 180-degree panoramic rendering is enabled; otherwise, 0. 1 if a 360-degree panoramic rendering is enabled; otherwise, 0. Sets the specified render mode. The mode determines the set buffers to be rendered. Returns the current render mode. The mode determines the set buffers to be rendered. int flags - A skip flag. 1 if the stereo rendering is enabled; otherwise, 0.
float distance - A focal distance in units. A focal distance in units. float offset - A virtual camera offset in units. A virtual camera offset in units. float radius - A stereo radius in units. If a negative value is provided, 0 will be used instead. int flags - Skip flags to append. int flags - Skip flags to check. 1 if the skip flags are set; otherwise, 0.
int flags - Skip flags to remove. Renders an image from the specified camera. This method is used to integrate the engine to a 3rd party renderer. const Ptr<Camera> & camera - Camera an image from which should be rendered. Renders an image of the specified size from the specified camera to the current rendering target. const Ptr<Camera> & camera - Camera, an image from which should be rendered. int width - Image width, in pixels. int height - Image height, in pixels. Renders an Engine viewport for the specified camera to the current rendering target. This method renders a splash screen and provides an image in accordance with panoramic and stereo rendering settings. const Ptr<Image> & image - Target 2D image to save the result to. Renders an image of the specified size from the camera to the 2D image. int hdr - HDR flag. const Ptr<Image> & image - Target cube map to save the result to. int size - Cube map edge size. int local_space - A flag indicating if the camera angle should be used for the cube map rendering. Renders the image from the camera into the cube map. const Ptr<Node> & node - Node to be rendered. const Ptr<Node> & node - Pointer to the node to be rendered. Renders the given node with all children to the specified 2D image. const Ptr<Texture> & texture - Target 2D texture to save the result to. const Vector< Ptr<Node> > & nodes - List of the nodes to be rendered. Renders given nodes with all their children to the current rendering target of the specified size. Renders given nodes with all their children to the 2D image of the specified size. const Ptr<Camera> & camera_left - Camera that renders an image for the left eye. const Ptr<Camera> & camera_right - Camera that renders an image for the right eye. const char * stereo_material - List of names of stereo materials to be used. const Ptr<Mesh> & hidden_area_mesh_left - Mesh representing hidden area for the left eye. const Ptr<Mesh> & hidden_area_mesh_right - Mesh representing hidden area for the right eye.